Anyone who drives on Freeway I-880 through Milpitas is frequently assaulted by foul odors that vary in intensity with the time of day, wind and humidity. But Milpitas residents face these smells every day in and around their homes and schools, and when they go about their daily errands. The source of the unpleasant smells is the Newby Island Landfill operated by Republic Services. The winds blowing through the Golden Gate move in a southeasterly direction over the Tri-Cities Landfill, then the larger Newby Island Landfill, and finally through central Milpitas. On Sunday morning, September 18, some 200 Milpitas residents said, ÒEnough is enough,Ó and ÒDump the dump.Ó They marched along Dixon Landing Road from Milpitas Boulevard to the entrance of the Newby Island Landfill. 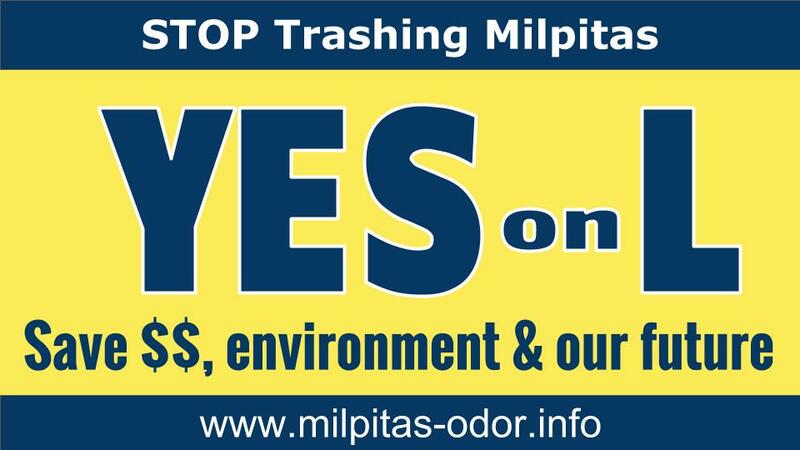 While Milpitas residents have been upset with the foul odors for decades, they had become particularly alarmed by Republic ServicesÕ proposal to extend the lifetime of the landfill and composting facility from 2025 to 2041 by raising the height limit from 150 feet to 245 feet. The City of Milpitas has appealed to the San Jose Planning Commission to reconsider the planned expansion. Newby Island lies within San Jose city limits. Milpitas residents, many of whom had never before engaged in a protest march, had been pressuring the Milpitas City Council to take action in an attempt to block the landfill expansion. The Newby Island Landfill, operated by Republic Services, is currently reaching its maximum capacity, but unlike more than 44 landfill operations around the San Francisco Bay that were closed when they reached their maximum capacity, Republic is requesting approval for an expansion that would increase capacity by 15 million cubic yards. Newby Island is the largest and one of the last remaining landfills around the San Francisco Bay. According to data from a state government organization, the Bay Area Air Quality Management District, on odor complaints, Newby has received 10 public nuisance tickets, 17 notices of violation, and over 7,000 odor complaints in two years. Because of the push from SVFBC (Silicon Valley Foundation for Better Community), San Francisco Water Board listed 1,4-dioxane as the new item to be tested. From test results for 2015, the SF Water Board found that groundwater contamination is already occurring and is bound to worsen. It hopes to convince the San Jose Planning Commission and City Council that new evidence of ground water contamination and an overwhelming number of odor complaints show that a new Environmental Impact Report (EIR) should be required. Milpitas residents have complained that the landfill operations not only produce a foul smell but also pollute the air and contribute to airborne particulates with unknown health consequences. They support a new EIR, one that they expect will confirm their complaints of hazards to livelihood, health and environment. Milpitas homeowners are also distressed that the incessant odors depress the resale value of homes. Jennifer Strohfus, Arzhang Kalbali and other Milpitas residents organizing with SVFBC have been fighting to halt the Newby Landfill expansion for almost two years. Some protesters are demanding, ÒNo expansion, no exception.Ó Arzhang Kalbali says that SVFBC is advocating a ban on all landfills located in urban areas. Jennifer Strohfus points out that we should all be consuming less and creating less garbage, to approach zero waste. Originally opened in the 1930s, the Newby Island Landfill was once surrounded by vacant land and open fields. Now it is rapidly becoming surrounded by urban development in Milpitas, Fremont, and San Jose. You can donate by sending money to our paypal account YesonLmilpitas@gmail.com OR click donate. We are fundraising for the ‘Yes On L’ campaign. We have several activities we want to fund including yard signs, flyers, and mailers. We need the money immediately to print our materials. We are asking for donations help us fund these activities. Vote Yes on Measure L! We have setup a dedicated website for the ‘Yes on L’ campaign. Please visit it http://YesOnL.vote. Lower garbage rates and improve services, Vote Yes on L.
It is a Measure to allow the unanimous decision by the Milpitas City council to continue with its decision to use Waste Management’s landfill in South San Jose. Who put Measure L on the ballot? Surprisingly, it was Republic Services who put it on the ballot. Because they lost out on the bid to get the business to use their landfill and want another chance at it. Why is it that voting Yes on Measure L would deny them this chance? They twisted the wording so that it would trick the voters to think that saying “Yes” would add something new. How much did it cost Republic Services to put it on the ballot? There’s no way of knowing the exact amount, but it is estimated to be around $10,000. This includes the $10 they paid the professional signature for each signature. How much did it cost the City of Milpitas to put it on the ballot? What will happen if Measure L does not pass? How much money is Republic Services putting into their campaign to fight against Measure L? Public records show that they have spent $600,00 so far. How much have supports of Measure L spent in support of Measure L? All the money that is spent to support Measure L comes directly from individual citizens. So far they have spent less than $20,000. How should I vote on Measure L? To have lower garbage rates and improve services, Vote Yes on L.
How do I get more information on Measure L? The City of Milpitas also has published a fact sheet on the new disposal contract with WM. Milpitas residents have been suffering under Republic Services’ Newby Island operations for decades. Our city does not benefit from disposal tax revenue as it sits on San Jose land, but we are negatively impacted as Newby Island uses our city address and pollutes our environment. Newby Island has grown from a local dump into one of California’s largest waste management facility, attracting waste streams not only from the Bay Area, but also from cities as far as Elk Grove, Merced and Clovis. Newby Island is now the largest and last active landfill along San Francisco Bay. Instead of following its original closure plan at 150ft height, Newby Island has applied to expand its landfill to an unprecedented 245ft height and operate beyond 2041. To make matters worse, Republic Services has a monopoly of Milpitas garbage contract for over 30 years. Milpitas residents pay the highest garbage rate in Santa Clara County for unlimited collections while we bear the burden of pollution. Regulatory violations continue to occur and Newby Island operations have now raked in over 30+ violations (including 11 for public nuisance violations) in the past 1.5 years. Over 5367 odor complaints logged to BAAQMD (Bay Area Air Quality Management District) and the City, which is 100 times above CEQA (California Environmental Quality Act) guidelines for odor threshold. Republic Services have been ignoring our pleas to suspend its expansion plan until odor is abated. It continues to lobby for landfill expansion permits and new long-term disposal contracts. Support Measure L because the City has done its due diligence in the entire Garbage Disposal/Collection process which was fair, competitive, and open. Voting YES on the Measure L would uphold the Milpitas City Council’s decision to award the disposal contract to Waste Management’s Guadalupe Landfill. Republic Services has held a 30-year monopoly of Milpitas garbage contracts. It did not submit a garbage disposal bid and now seeking to undermine the RFQ process costing the city an additional $58,000 to place this item on the ballot. Waste Management who won the disposal contract is the lowest qualifying bid and had demonstrated strong regulatory conformance with 50-years remaining landfill capacity. Oppose the Newby Island Landfill expansion. This is just bad idea with excess landfill capacity remaining in the county, so there is no need to expand Newby Island Landfill and bring more garbage into a densely populated and environmentally sensitive area. An expansion is also counterintuitive to state mandates on recycling, composting and source reduction.We have low confidence in Republic Services based on their track record. They spent $27 millions in odor measures at their Sunshine Canyon Landfill in Southern California, and violations persist. This is evidence that a full-proof odor mitigation technology does not exist. We are extremely frustrated because other states have denied permits and ordered landfill closure as in the case of the Tullytown landfill which has a similar scenario where one city has the permitting jurisdiction, another city downwind bears the odor impact. North San Jose, Milpitas, Fremont residents deserve equitable protection, especially since Newby’s odor has been an on-going problem for decades. Reject any campaign contribution by Republic Services. Republic Services works by deeply getting involved in local politics and preaching that they are not the dominant source of odor and is the only viable solution to Garbage Disposal and Collections services. We know from working with BAAQMD that their investigation has pinpointed Newby Island as the source for 90% of confirmed complaints in the area. The RFP process has shown that there are many many companies who would do business with Milpitas without causing pollution in our town. Apply pressure on Republic Services to cleanup their facility. We need to apply pressure to Republic Services at all level of government local, state, and federal. We have escalated the problem to all regulatory agencies. They’ve done their investigations and uncovered violations. Improvements were made, but odor problem is persisting. Regulatory violations continue to occur and Newby Island operations have now raked over 30+ violations (including 11 for public nuisance violations) in the past 1.5 years. Unfortunately, the regulatory agencies have no fixed timeline for compliance and not ready to push administrative or legal actions. Small fines is chump change to multi-billion waste management companies. Residents’ livelihood is compromised in the name of corporate profits. We hope that you will commit to cleaning up the dire situation in Milpitas from the pollution caused by Republic Services’ Newby Island Resource Recovery Park.